LONG BEACH, Calif. — Private suborbital space planes built by two space tourism companies will likely launch some major test flights before this year is out, their builders say. The commercial spaceflight company Virgin Galactic plans to launch its SpaceShipTwo spacecraft into space for the first time by the end of 2013. The company performed its first rocket-powered test flight in April. 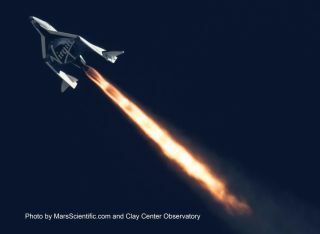 Meanwhile, the firm XCOR Aerospace is aiming for the inaugural non-spacebound flight of its Lynx vehicle during that same time period, officials from both companies said on Tuesday (May 21). Pomerantz appeared on a commercial panel moderated by NanoRacks managing director Jeffrey Manber that included XCOR chief operating officer Andrew Nelson and Eric Anderson, chairman of the space tourism firm Space Adventures. The panelists were optimistic about progress on both the development and business sides of the industry. "Finally, it seems that we're going to have a robust space tourism market," said Manber, who led efforts to commercialize the Russian space station Mir in the late 1990s. "The customer is going to have different choices … There are different price ranges, different experiences." Pomerantz said Virgin Galactic has signed up around 580 clients who have put down more than $70 million in total deposits for flights. Customers range in age from under 18 to their early 90s, and include people from more than 50 nations. XCOR has sold 275 flights on the two-person Lynx spacecraft during the past 24 months, part of a "Right Stuff" experience that places the spaceflight participant in the cockpit with the pilot, Nelson said. Virgin Galactic's larger SpaceShipTwo will include two pilots up front and six passengers in the cabin. "We're competing with the world's greatest marketeer, so we have to try to make it a little bit different," Nelson said, referring to Virgin Galactic founder Sir Richard Branson, the flashy British billionaire behind the global Virgin Group empire. "We have to differentiate ourselves in the market … We probably wouldn't be nearly as creative if Virgin wasn't in the market." XCOR's methane rocket successfully passing a test in the Mojave Desert. The technology could make planets and moons into space-based refueling stations. Manufacturer Unilever purchased 22 Lynx seats that it will award to winners of a global competition, part of a marketing campaign for its Axe and Lynx grooming products. Nelson said that more than 600,000 people entered the contest in the first three months. The company, which will spend a reported $130 million on the contest this year, has seen sales jump an estimated 20 to 30 percent in the AXE segment in the immediate aftermath of the campaign launch, he added. Meanwhile, SpaceShipTwo has become an integral part of the Virgin Group, which has a large base of clients who passionately love the brand and are eager to try the next experience that Branson can create for them, Pomerantz said. "For us at Virgin, certainly, it's all about the brand," he said. "I mean, that's what Virgin Group is … We have everything from wine to Formula One cars to submarines to, they used to do wedding gowns. It's everything. It's whatever Richard wants to do and whatever he thinks he can make money on and he can make the world a better place with." The panelists were upbeat on the overall business climate, saying it is becoming easier to find investors and partners willing to put money into the industry. "I think there's going to be our Netscape moment soon, during the next 24 to 36 months," Nelson said, referring to the Internet boom set off when the Web browser company went public. Anderson marveled at the changes that have occurred in the industry since he founded Space Adventures in 1997. "It's an entirely different time now than it was 15 or 16 years ago," he said.